Air India has stopped accepting bookings for its flights between New Delhi and Moscow effective 15th July 2017. The flight between the capitals of two countries was launched in July 2014, after 15 long years and operated daily at its peak and was scheduled to be four times a week. The flight was reduced to twice a week in July 2015 and since then seen change in equipment to A320 family along frequent changes in frequency. 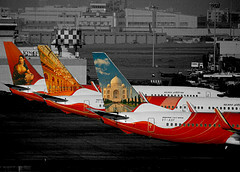 The route was one of the initial B787 led expansion for the National carrier and Star Alliance member but the growing business, defence ties and tourism which was expected to work in favour of Air India was hampered by lower oil prices impacting the Russian economy and fall in rouble value affecting inbound tourism in India. What would have been a great plan during a planning stage seems to have quickly turned into a nightmare since the planning would have been at times which preceded the Russia Ukraine conflict while the operations started post it. Since then the Russian economy has faced sanctions and the country has had disputed with European Union and Turkey amongst others. Air India started with a late night departure from Delhi and early morning arrival at Moscow Domodedovo, one of the many airports in Moscow. Russian National Carrier is based at Sheremetyevo and is a Skyteam member. The largest Russian airline at Domodedovo – S7 Airlines is an Oneworld member. The early morning arrival and quick turnaround reduced the possibility of codeshare agreement with quick two-way connections. As always Sir, a superb piece of analysis, and some great graphs and graphical representations. You have analyses the situation beautifully right from the barrel prices to the politics, and flight timings. You described the 2015 challenge beautifully with the pressure out of SVO and VKO, and SU going twice daily with A330s since Feb'16. SU will still lead with its connections out of MOW, and more so, from the point of view of small and medium businesses, whose seamless cargo connections are important. SU has traditionally had a stranglehold over the market, and Business as well, and have good planes (A330s), which can compete against the newer entrant with better planes. AI will do better right now with more planes for the Oz ops + European expansion, and perhaps launch MOW again when they have had a firmer grip over Europe. Thanks for a lovely article, once again. Thanks for the kind words. Probably will make sense for AI to revisit MOW with different timings and onward connections on the neo sometime later ! Air India starting this Saturday (10JUN17) plans to introduce additional service to Bhubaneswar, with 1 daily flight each from Hyderabad and Kolkata. Air India's plans to expand its fleet with new aircraft seems to have hit an air pocket following the NITI Aayog's proposal to the PMO its total privatisation which made the national carrier's future course uncertain. Decisions earlier approved by the airline's board of directors regarding acquisition of newer versions of aircraft are currently "on hold" and tenders for procurement of new planes have been deferred till there is a clarity, an airline source said. Air India's board of directors had in March approved a proposal to induct seven Boeing 787-9 aircraft in its fleet with the aim to improve connectivity to Canada, the USA and Australia. The airline was planning to float tenders for procuring these aircraft on lease this month, which has now been deferred. "The decision (of floating tenders) is on hold until there is a clarity on the airline's future," a top Air India official said. Similarly, plans to procure 10 more ATR aircraft by Air India's regional arm, Alliance Air, which has been awarded several routes under the Centre's regional connectivity scheme UDAN, have been put on the back-burner, the official said. This is a joke they are stopping their search for leasing aircraft??? Privatization is going anywhere. And even if it was, the airline still needs to function. 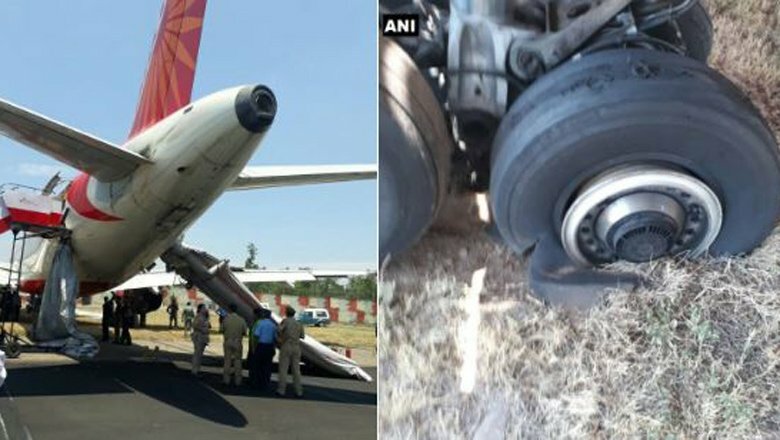 Almost 140 people on Air India's Delhi-Jammu flight on Friday afternoon had a narrow escape when the plane could not stop in time on the runway and went into the kutcha area at the end of the small airstrip in Jammu. According to sources, AI 821 had 134 passengers on board when the 23-year-old old Airbus A-320 (VT-ESL) touched down in Jammu. "The preliminary information is that pilots applied emergency braking too but the plane did not stop on the runway and overshot it. Four tyres got deflated. Passengers were evacuated using emergency chutes," said an official. All passengers are learnt to be safe. However, it could not be ascertained by the time of filing this report if some people on board AI 821 sustained injuries during evacuation. AI was going to very soon retire the classic A-320 which was among the first batch of planes erstwhile Indian Airlines had received in December 1994. The critical for defence purposes Jammu runway is closed for other flights till the stuck aircraft is removed. All flights have reportedly been cancelled till the plane is removed. This includes the return flight VT-ESL had to operate to Delhi. Aircraft operations in Jammu take place only till sunset and unless the old Airbus is removed quickly, flight resumption may take a long time. Announcements in Air India flights will soon be short, crisp and without errors to ensure passengers are not disturbed by them. After feedback from fliers, the airline has finalised a new set of announcements that will not be repetitive. Also, to ensure zero error, Air India will do away with manual announcement and have pre-recorded announcements for different circumstances and destinations. The details of destination weather and rules related to arrival are announced just before landing and often, crew members commit mistakes in reading it out from the booklet. “Earlier, after landing, we used to announce that passengers who have kept their mobile, sunglasses, wallets and other items in the front seat, should not forget to take it with them. Now, it has been changed to “passengers are reminded to take items, which they have kept in the front seat”. Like this, we are making the announcement short,” said an Air India official. Another official, however, said safety instruction announcements would not be changed. In a two-hour flight, Air India usually made 10-12 announcements, but the frequency is now reduced to eight. “Once a passenger starts boarding, we start with announcement related to fuelling, then introduction of crew and welcome announcement by pilot. Then we move to safety instruction and after take-off, announcements are made related to refreshment. Now, we will have just one announcement in the beginning giving details of crew and welcoming the passengers. Instead of announcements every five minutes, we will have one announcement with all the details,” the official said. “Our objective is to make it short and crisp and relevant. The recorded statement will be used to ensure zero error,” Air India CMD Ashwani Lohani said. Desperate times call for desperate measures. Facing an uncertain future, Air India employees are coming up with radical measures to cut costs that include removing salad from economy class meals on international flights and carrying fewer magazines on planes to reduce weight because a lighter plane burns less fuel. However, the debt load of over Rs 52,000 crore may mean these suggestions are coming in too little, too late as the government has decided to sell off the airline. A senior AI official has said in an internal mail to top management that on a recent flight, a cabin crew incharge walked up to him to suggest some cost-cutting moves. "One was that in international flights economy class, he found only 20% eating salad. He (the cabin crew) felt we must discontinue salad in economy class on international flights. He also felt that we must carry only around 25 copies of Shubh Yatra (AI's insight magazine) in a flight which can be kept in the magazine racks rather than on every seat to reduce weight," the official's internal communication says. Alliance Air has added a new ATR72-600 to the fleet today, as VT-RKD. Dumb - salads are not the problem (also food is cheap in India, food has always been AI's saving grace). Their issues have to do with the bureaucracy and SOME of AI's employees who act like they work for the railroads. That limp piece of kakri and a slice of tasteless tamaatar is a salad now? And THAT's what's gonna help save AI money? Babu 1: Arre dekho tho. Amrikan walon ne salaad mein se ek aalive nikal ke kai carodon doller bachaye hain. Hum kyon na karen? Babu 2: Lekin saar, hamare salad me aalive nahin lagte na? Babu 1: Arre, tho kya kya daalte hain salaad mein? Babu 2: Tamatar aur khakdi. Babu 1: Haan tho nikal do salad. Us tamatar aur kheera wala contractor ne abhi tak apna cut nahin diya. Marvayenge saale ko! Air India has added a new A320NEO to the fleet today, as VT-CIF. At least three aviation companies, besides the Tata group, have shown an interest in acquiring a stake in the beleaguered national carrier Air India. Sources close to the airline said that initial meetings had taken place with possible buyers, including the Tata group. “After Finance Minister Arun Jaitley’s interview to Doordarshan News in the last week of May saying the government is open to privatising the airline, three or four possible buyers – including the Tatas – have met with both the Finance Ministry and the Ministry of Civil Aviation,” the source said. BusinessLine could not independently confirm the names of the other suitors, and is therefore not disclosing their details, but among them are at least two international airlines. It make sense if each of them acquire some stake. That way they share the risk and debt. For taking on such a big risk, no sane investor would accept anything other than a 51% stake. Nobody wll want to take up such a liability wihout the right to call the shots. Now watch the Saffron Chaddi brigade go after this cartoonist for blasphemy, apostasy, treason, etc., etc. The Civil Aviation Ministry is in favour of retaining Air India’s (AI) brand name even as the Centre is looking for a strategic investor to buy a stake in the national carrier. The government clarified that the stake sale in AI will not impact its flight operations. “We are very clear that all commitments and contracts that Air India has undertaken right now will be fully honoured. It pertains to passengers, employees, financial institutions and all other stakeholders,” Mr. Sinha said. He said the group would also take a decision on whether the subsidiaries will be divested separately. “Whether subsidiaries should go as part of Air India meaning whoever buys Air India automatically buys this or whether they should be completely de-merged and divested simultaneously but separately will be decided,” he added. The Centre was also open to sell Alliance Air and Air India Express to private players. Has Air India launched DEL-TLV flights? Werent they supposed to fly from May? Wasn't it supposed to be BOM-TLV? Inany case, it is a waste of a flight. The traffic between India and Israel is almost entirely Israeli, and israelis won't fly any carrier other than EL AL. Apparently it's DEL-BOM-TLV (787?). This must be AI's first new BOM route in a long time - can anyone remember the last one? I see that El Al, too, flies only to BOM and not to DEL. Anyone know why Israel-India traffic is so BOM-focussed? I see that El Al, too, flies only to BOM and not to DEL? E AL's TLV-BOM flight takes an out of the way route from TLV, over the Red sea, around the Horn of Africa and then eastwards across the Arabian Sea to BOM. This is because EL AL cannot fly over Arabian airspace. To get to DEL, they would have to fly the same route over BOM, and then turn northwards to DEL, as EL AL are not allowed over Pakistani airspace as well. So they may as well fly only to BOM. Yeah it looks like (I have no proof) that either Israel or Pak/Afgh didn't want the flight going over Pak/Afgh so the southern route was chosen. So it looks like AI said why not just stop in BOM. Ideally I would have liked to see AI fly DEL-TLV and 9W BOM-TLV. That said, this is a good development and should help bring more tourists/businessmen to both countries and maybe add some feed to AI's BKK, CMB and SIN flights. Would it be easier to fly north from DEL, over Tajikistan, Uzbekistan, Turkmenistan, Caspian Sea,Azerbaijan, Turkey and into Israel. Wouldnt that be shorter? That route would take them rather close ie within SAM missile striking range of Northern Pakistan, Afghanistan, and maybe even Iran, wouldn't it? LY's BOM flight flies almost along the borders of Saudi without a problem. And we are talking abt an AI flight here. The only problem is flyover rights and not a security concern. AI wouldn't have any problems flying any route. I was talking about EL AL getting too close to the missile points and not flying to DEL as a result. EL AL flies close to Saudi because they can't avoid it given their geography. But I guess they would want to avoid other potential hotspots if they can. Flights to Israel cannot fly over most Arab countries. Even AI will have to take a circuitous route for a flight from DEL to TLV. Says who? TLV sees airlines from all over Europe and North America, and Israelis have no qualms about flying them. I've been onTG BOM-BKK flights packed with Israelis. It doesnt matter westwards.But flying east - they prefer flying LY over other airlines simply to avoid a possibility of landing in an Arab country in an emergency situation. Connecting in BOM is another cheaper option for Israelis - given LY brings them safely around the Arab peninsula. They would however still avoid SQ coz of Malaysian fly over. My Israeli clients flew into Australia via the US instead of taking an Asian route as they wanted to avoid what they call "enemy countries". So yes there is a huge preference to fly LY as far as possible when flying east. Air India has added a new A320NEO to the fleet today, as VT-EXV. The first direct Air India flight from Delhi to Washington DC landed today at the Dulles International Airport, connecting the capitals of the world’s two largest democracies. The flight, AI 103, was accorded a water cannon salute and traditional gate-side prayer ceremony upon its landing at the airport. Air India has deployed its 238-seater Boeing 777-200 LR aircraft to cater to the new direct service to the US. The plane offers eight seats in first class, 35 in business and 195 in economy class. The state-run airline will operate a bigger 321-seater Boeing 777-300ER aircraft between July 9 and 17, according to the airline spokesperson. Air India plans to expand its base in the US by adding Los Angeles and Houston into its roster, a day after launching the state-carrier's first direct flight from Delhi to Washington DC. "We are looking at connecting two more cities - Los Angeles and either Houston or Dallas, Air India Chairman and MD Ashwani Lohani said at an event to celebrate the launch of the direct non-stop flight yesterday between the capitals of the two largest democracies of the world. The direct flight to Los Angeles is expected to be launched by October, while the date for the flight to Houston or Dallas in Texas has not been determined yet, Lohani said. All this is part of the expansion plans of Air India, he said. Washington DC is Air India's fifth US destination after New York, Newark, Chicago and San Francisco. I bet they are weeping about selling those 77Ls to EY now. That too at such throwaway rates. Air India stopped serving non-vegetarian meals to economy-class passengers on all domestic flights from mid-June this year. “We have decided to serve vegetarian meals in our economy-class seats on domestic flights,” Air India Chairman and Managing Director Ashwani Lohani told The Hindu. However, non-vegetarian meals would continue to be served in business and executive class on domestic as well as international flights. Another executive said there was an increasing preference among passengers for vegetarian food. “The number of vegetarian passengers is increasing. Generally, we uplift 70% vegetarian meals and 30% non-vegetarian meals,” he said. “However, because of the increasing preference for vegetarian meals, wastage of non-vegetarian meals became high. Also, we run short of vegetarian meals, leading to complaints. So we decided to serve only vegetarian meals in certain sectors,” he said. The official said half the number of passengers did not specify their meal preference at the time of booking. As a result, he said, the airline was “kept in the dark” about their choice. Last year, Air India stopped serving non-vegetarian food to its economy-class passengers on flights lasting up to 90 minutes. It also took tea and coffee off the lunch and dinner menus as a cost-cutting measure. But it allowed the passengers to opt for either vegetarian or non-vegetarian meals on all domestic flights exceeding 90 minutes. Air India this week is operating last service to Russia, where it currently operates Delhi – Moscow Domodedovo route, twice a week. The Boeing 787-8 operating service currently scheduled to operate until 15JUL17 (16JUL17 from DME). Alliance Air has added a new ATR72-600 to the fleet today, as VT-RKE.